DO YOU KNOW WHAT BEARING THE CROSS OF JESUS MEANS? Six times in the New Testament Jesus commands us to take up our cross and follow Him. This was a very important command because He also said that anyone who does not take up his cross and follow Him was not worthy of Him. Since Jesus has yet to be crucified on the cross at this time, what cross is He talking about? When the Romans convicted someone and sentenced them to be crucified they were made to carry their own cross to the place where it was to be erected. Usually they were guilty of something heinous to be crucified. However, Jesus was not guilty of anything and didn’t deserve to be crucified. Jesus didn’t carry His cross to Golgotha, but a man of Cyrene named Simon was compelled by the Roman soldiers to carry the cross. This is all symbolism of Jesus’ innocence. He was guilty of nothing; therefore He did not carry His cross. What about us? Are we guilty of anything? Why is Jesus telling us to carry our cross and follow Him? We have all sinned and come short of the glory of God. Matthew 16:24 Then said Jesus unto his disciples, If any man will come after me, let him deny himself, and take up his cross, and follow me. We are commanded to deny ourselves and to follow Him. What are we to deny? It is ourselves! Luke 16:15 And he said unto them, Ye are they which justify yourselves before men; but God knoweth your hearts: for that which is highly esteemed among men is abomination in the sight of God. Jesus wants us to humble ourselves. Matthew 23:12 And whosoever shall exalt himself shall be abased; and he that shall humble himself shall be exalted. Matthew 18:4 Whosoever therefore shall humble himself as this little child, the same is greatest in the kingdom of heaven. 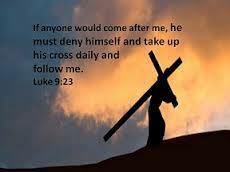 We should examine ourselves and ask God how we can carry our cross for Jesus Christ. You cannot carry a cross for Jesus unless you rid yourself of pride, lust and coveting. Jesus teaches us in the “Sermon on the Mount” that when we look upon a women and lust after her we have committed adultery and if we hate someone we have committed murder. Oh, there are many things to take into consideration before taking up the cross of Christ. Here is an example of a young man who was offered his cross. Mark 10: 17-22 And when he was gone forth into the way, there came one running, and kneeled to him, and asked him, Good Master, what shall I do that I may inherit eternal life? And Jesus said unto him, Why callest thou me good? there is none good but one, that is, God. Thou knowest the commandments, Do not commit adultery, Do not kill, Do not steal, Do not bear false witness, Defraud not, Honour thy father and mother. And he answered and said unto him, Master, all these have I observed from my youth. Then Jesus beholding him loved him, and said unto him, One thing thou lackest: go thy way, sell whatsoever thou hast, and give to the poor, and thou shalt have treasure in heaven: and come, take up the cross, and follow me. And he was sad at that saying, and went away grieved: for he had great possessions. 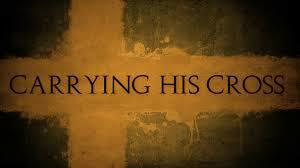 That young man failed to do what was needed in his life to be able to carry the cross of Christ. He went away and didn’t follow Jesus any more. He may have missed out on eternal life and being a disciple of Christ. When someone is put to the test it is hard to separate oneself from the ways of this world. Jesus’ disciples asked the question, “Then who can be saved?” Mark 10: 27 And Jesus looking upon them saith, With men it is impossible, but not with God: for with God all things are possible. We have to confess that we are sinners and if the wages of sin is death then we are all under the death penalty. We have a loving God Who wants us to be with Him for all eternity. God is love and He created mankind to be in His family forever. Unfortunately there are those who do not know God and there are those who know about God and still do not want anything to do with Him. God has such a great reward waiting for us in heaven that it is amazing that there are people who don’t care. They believe that they will enjoy the fruits of the world and then it is all over. But that is not the case. Those who reject Christ will stand before Him at the Great White Throne Judgment and give an account of their sins. Are you ready to believe on Him and take up your cross and follow Him? Then tell Jesus you repent of your sin and are sorry to have put Him to such shame that He had to die in your place on His cross so that you could have eternal life. Ask Jesus to forgive you, to come into you heart and you will receive the gift of the Holy Spirit. You do this and you will have eternal life. You have taken up your cross! Jesus receive those who receive this message sincerely in their heart. Categories: Devotionals | Tags: cross, deny ourselves, eternal life, follow Christ, gift of God, repent of your sins, take up our cross, take up your cross, wages of sin, with God all things are possible | Permalink.